Negative risks are when things could go wrong on a project. However, it’s also possible for risks to be positive. Yes, really! 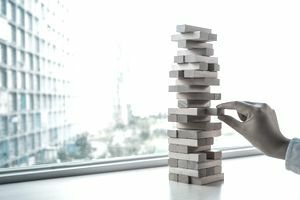 We tend to think less about positive risk in project management, probably because team members, managers, and project sponsors focus more on what could go wrong. Positive risks are situations that could provide great opportunities if you only harness them effectively. There are also formal management strategies for responding to positive risks. They are: Exploit, Share, Enhance, and Accept. Let’s look at them in more detail. This response strategy tries to make sure that the risk happens, so you get the perceived benefit from the situation. Simple ways to do this could be to train the team to give them extra skills or to tweak your deliverables slightly so that they respond better to the opportunity. Remember that positive risk doesn’t have to only apply to the deliverables you are creating. It can also apply to the way you are creating them. An excellent example of this is if someone on your team comes up with a way of cutting the project timescales by 10 percent if you make a change to a project management process. By training people in the new process, you can increase the chance that you’ll exploit the opportunity to deliver 10 percent faster. It can be hard to think up ways that you could exploit the opportunity so that you make the situation happen. Spend some time brainstorming to see what you can come up with. An excellent example of the Share response is in bidding for work. You may find that your bid would be more successful if you partnered (i.e., shared) with another firm. The opportunity (in this case, winning the bid) would be more likely to happen if you worked as a team. Another example might be if you are building something, working in partnership with a specialist firm for a particular component might give you the edge. Enhancing the opportunity can come about when you focus on the causes of the opportunity. In other words, what are the factors that are going to make this positive risk/opportunity happen? Think about how you can influence those factors. This could be by introducing software features to make the new product more marketable or shareable. It relies on being able to adequately articulate what is going to cause a beneficial situation to happen so that you can focus your efforts appropriately. Get everyone on the project team together to come up with ideas. You’ll find it easier to work out how best to respond to the situation as positive risk response strategies can be challenging to get your head around. When taking action is going to be too costly for the benefit you’d get back if the opportunity did happen. When taking action is disproportionate regarding work: it’s too much effort to put the plans in place based on the likelihood of the risk happening. There might be other situations where you would instead do nothing. As long as you take this option as a considered approach and not because you didn’t get round to making a decision, then that’s fine. Most risk management is focused on trying to avoid situations happening that are going to be bad for your project. That's why it can be hard to get people to think about the things that might go right, and how, in those cases, you are going to capitalize on the situation and make the most from it. Use your Project Board meetings as a starting point for this kind of discussion. Whichever one of these positive risk response strategies you choose, your risk response strategy should be noted down in your risk register.